5 Reasons You Didn't Reach Your Financial Goals Last Year - Women and Money Inc.
And at the back of your mind, you’re worried you won’t be able to stick to the changes required to achieve your goals. I’ve been there, so I want to give you some advice to help you succeed. 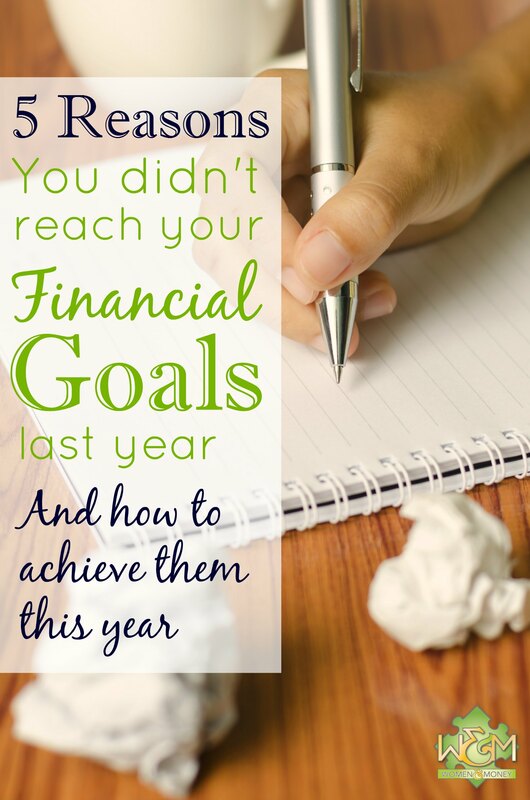 Let’s look at the top 5 reasons why you didn’t achieve your financial goals last year, and how to achieve them this year. #1. One reason why you didn’t reach your financial goals last year is because you were trying to sprint to the finish. You think you need to make major changes to your budget and spending habits. You begin, and find the changes aren’t sustainable. Or you don’t begin because you are so overwhelmed by the thought. Think of the path to financial success as a marathon rather than a sprint. Make a long term plan. Take your big dream, and then break it down into short term steps. Give yourself time to reach each step. So you want to be a millionaire? What is your timeline for becoming a millionaire? Five years? What can you do this year, that will get you at least one fifth of the way there? Can you get your net worth to $200,000 this year? What action can you take each month, each week, each day, to reach that goal by the end of the year? Whatever your big dream is, realize that it is a long term goal and you MUST take well-paced strides to get there, because sprinting will just wear you out and keep you from ever reaching the finish. #2. Another reason you fail to reach your financial goals is because they aren’t SMART. Let’s continue with the ‘become a millionaire’ example and make it a SMART goal. Achievable: Many people have a net worth of a million dollars or more, so this is achievable. If you have a very low net worth in the beginning, it may take longer to reach the goal. Relevant: I want to have a net worth of 1 million dollars BECAUSE I want to have financial freedom, to be able to take care of my family, and of course to brag to my frenemies. Timely: I will have a net worth of 1 million dollars by January 1, 2020. So now becoming a millionaire is no longer a vague dream, it is a very specific goal with a specific timeline. Make your financial goals SMART goals. Then plan your marathon for reaching them. If you want to learn more about effective goal setting, sign up to be notified when our Goal Setting Workbook (currently in development) is available. #3. Not watching the big picture is another reason you fail to reach your money goals. Sometimes when we set a specific financial goal, we have a tunnel vision of that aspect of our finances. Let’s say your goal is to pay off your credit card, so you divert all extra funds to your monthly bill payments, rather than your savings account. Your liabilities are going down, but your assets are not increasing. Then an emergency expense pops up and you don’t have the cash to cover it, so your credit card balance goes up again. If you had the bird’s eye view, you would see that your credit card payments shouldn’t be taking away from your savings account but rather from your other expenses, in order to maximize the net gain and safe-guard against emergencies, reaching your goal even faster. Instead of diverting your savings to debt repayment, you would reduce fixed and discretionary spending and divert that money to your credit card. To get a handle on the big picture of your money, keep track of your Net Worth. Don’t compare your net worth number to others, or to what you dream it would be. Simply take it as a starting point and use it to track your own progress. Your net worth might be a negative number, or might be a low positive, but remember it is not a reflection on your value as a person nor an indicator of future failure. It is simply the equation of your finances at this point in time. It’s your point A. Now you set your sights on point B, and when you arrive, look back and see how far you’ve come. #4. Another reason you don’t achieve your financial goals is you can’t put the numbers into perspective. You tracked your spending and made a budget. You know how much you spend on what. But you don’t know if those amounts are good or bad. How do you know how much is too much? Doing this simple change will drastically change your vantage point: Evaluate your spending in terms of percentages of your net income, rather than as dollar amounts. Viewing your money in percentages lets you fully understand how your money is being divided up, as well as allows you to place appropriate value on each area of your finances. If you are a visual person, it’s very helpful to view your spending as a pie chart. Each category of your spending occupies a slice of the pie, and how big each slice should be is what you need to decide for yourself based on your own goals and lifestyle. You may come to realize that worrying about those occasional coffee splurges is a waste of energy because it occupies such a small slice of the pie. On the other hand, you might now see that your transportation spending is taking an unacceptably large piece of your money pie. And how much of the pie is dedicated towards your financial goals? Retirement, travelling, debt freedom, buying a home… whatever your priorities are, those should be reflected in receiving large pieces of your money pie. #5. Another major reason you don’t reach your financial goals is lack of organization. An essential change to achieve your financial goals this year is to organize your papers and create a system. You need a process and a schedule for how you will handle your finances on a regular basis. When do you pay all the bills and how? How do you organize the incoming paperwork and when do you dispose of it? Take some time to work out a system that will work for you, and then follow it. You can tweak it as you go if needed. The important thing is that you have an organized and pre-determined method for dealing with your money and at the same time, achieving your financial goals. Don’t know how to organize and create a system? Our Improve Your Finances in 1 Week Workbook has 7 days of tasks and worksheets including how to set up a paper station and processing system. The workbook covers all points in this article and will completely overhaul your finances in just 7 days. Sign up to be notified when the workbook becomes available. These 5 reasons for failing financial goals may not all apply to you, but if I can help you reach your goal with even one of these changes, then I haven’t written this for nothing. I hope I have inspired you to do your goals differently this year and sincerely hope you reach them. A final note: setting big, lofty goals can be scary, but remember not to fear failure. If you jump for the moon and only reach a star, you are a lot farther ahead than if you had just laid down on the Earth to admire the moon right? Making progress towards your goals is a success in itself. Celebrate your progress, stay motivated, and be proud of yourself. This entry was posted in Blog, Budgeting, Debt, Personal Finance, Saving Money, Women and Money. Bookmark the permalink. Both comments and trackbacks are currently closed.